MO HealthNet providers billing vaccines for dual eligible participants shall bill Medicare for all vaccines. Vaccine coverage under Medicare Part B includes the pneumococcal, influenza, and Hepatitis B vaccines for individuals at high or intermediate risk, and vaccines directly related to the treatment of an injury or direct exposure to a disease or condition. Other vaccines not covered by Part B are covered by Medicare Part D (pharmacy benefit). When a provider cannot bill the Part D plan directly, the vaccine should be dispensed at a pharmacy. In some cases, a pharmacist may administer the vaccine following the MO Board of Pharmacy guidelines. Providers must charge and collect the shared pharmacy dispensing fee amount required to be paid by MO HealthNet participants. Providers may not deny or reduce services solely on the basis of the participant's inability to pay the fee when charged. A participant's inability to pay a required amount shall in no way extinguish the participant's liability to pay the amount. The amount is a legal debt and is due to the provider. The provider must keep a record of the cost sharing amounts collected and the amounts due but uncollected because the participant did not make payment when the service was rendered. MO HealthNet providers billing pharmacy claims with reimbursement issues must contact Pharmacy and Clinical Services at (573) 751-6963 prior to dispensing. Reimbursement will be reviewed and if MO HealthNet determines a pricing update is needed, it will be made effective the date of review. If additional review is necessary, the provider must submit the MAC Pricing Inquiry Worksheet. The worksheet may only be submitted when instructed by MO HealthNet and only for the drug(s) specified. The inquiry will not be reviewed if the worksheet is received incomplete, lacking the required invoice, for more or different drugs than instructed, and/or containing Protected Health Information (PHI). Upon review, providers will be notified of the outcome of the pricing inquiry. Any pricing updates will be made effective the date the pricing worksheet is received, not the day the provider called with the reimbursement issue. It is the provider's responsibility to confirm the request was received on the day it was faxed. It is imperative that the worksheet is submitted on the same day the medication is dispensed, if the provider chooses to dispense below cost. MO HealthNet providers shall make every effort to resolve reimbursement issues prior to dispensing and are not require to dispense below cost. Containers of medication in solution (for example, ampoules, bags, bottles, Vials, syringes) must be billed by exact cubic centimeters or milliliters (cc or ml) dispensed, even if the quantity includes a decimal (e.g., if three (3) 0.5 ml vials are dispensed, the correct quantity to bill is 1.5 mls). Single dose syringes and single dose vials must be billed per cubic centimeters or milliliters (cc or ml), rather than per syringe or per vial. Ointments must be billed per number of grams even if the quantity includes a decimal. Eye drops must be billed per number of cubic centimeters or milliliters (cc or ml) in each bottle even if the quantity includes a decimal. Powder filled vials and syringes that require reconstitution must be billed by the number of vials. Combination products, which consist of devices and drugs, designed to be used together, are to be billed as a kit. Quantity will be the number of kits used. The product Herceptin, by Genentech, must be billed by milligram rather than by vial due to the stability of the drug. Non-VFC Immunizations and vaccines must be billed by the cubic centimeters or milliliters (cc or ml) dispensed, rather than per dose. Provider-based Rural Health Clinics (RHC) should not bill the MO HealthNet Division (MHD) for the technical component of laboratory and radiological services. Section 13.1.B of the RHC manual states the technical component of laboratory and radiology are not RHC services. Section 13.3.A states RHCs may bill the MHD using their active non-RHC NPI for the technical component of laboratory, radiology and electrocardiogram (EKG) services. RHCs will be reimbursed according to the MHD fee schedule. RHC providers not currently enrolled as an active non-RHC must complete and submit a Provider Enrollment application. claims as a non-RHC, the performing provider NPI field must be completed. Please reference the applicable sections found in the RHC provider manual. Effective May 1, 2017, the MO HealthNet Managed Care program is offered statewide to all 114 counties and the City of St. Louis. Approximately 240,000 participants, who previously were enrolled in the MO HealthNet Fee-For-Service (FFS) program, are transitioned to a Managed Care health plan. These new Managed Care participants join about 500,000 existing Managed Care participants, amounting to an estimated 740,000 Missourians in the Managed Care program. Participants have received welcome packages from their health plans and will receive services through their health plan’s network of providers. Missourians who are aged, blind or disabled will remain in the MO HealthNet FFS program. MO HealthNet FFS and Managed Care program participants will not lose eligibility or coverage as a result of the transition to statewide Managed Care; health care benefits will remain the same. Providers currently enrolled with MO HealthNet’s FFS program in the counties impacted by the Managed Care geographic extension are encouraged to contract with the three newly awarded MO HealthNet Managed Care health plans and to maintain their enrollment with MO HealthNet. 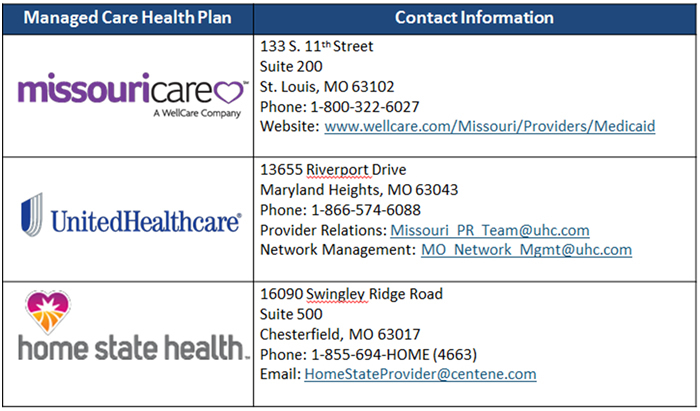 To contract with the MO HealthNet Managed Care health plans, contact them directly. Open enrollment for participants to choose a Managed Care health plan ended April 3, 2017. Participants who did not enroll by April 3, 2017, have been auto-assigned to a health plan. Participants have 90 days from the date coverage starts to change health plans for any reason. For example, a participant may change health plans if their provider is not contracted with the same health plan. After the 90 day period has passed, participants may change health plans if they have “just cause.” For more information, refer to the Participant Resource on “just cause” http://dss.mo.gov/mhd/participants/mc/files/changing-managed-care-health-plans.pdf. Please note: While the Managed Care program is based on the MO HealthNet FFS program, the two programs have differences. The Managed Care health plans are not required to follow the FFS program’s prior authorization or timely filing rules; in certain circumstances, the Managed Care health plans may establish rates of reimbursement different than the FFS program. Providers are encouraged to work with the Managed Care contracting teams to define and understand those differences and negotiate a mutually satisfactory agreement. The MO HealthNet Division will update the participant’s enrollment end date to remain enrolled with Aetna until the date of discharge. The effective date of the health plan enrollment will depend on the participant’s inpatient hospital discharge date. MO HealthNet Division (MHD) still uses day specific eligibility. The MHD recently informed providers of the new Emomed functionality allowing them to view participant information and Managed Care enrollment up to 31 days in the future. The recent change to Emomed was “technical only” and does not reflect a change in eligibility policy. Participant eligibility must be checked on each date of service. Eligibility can change for MHD participants daily. For additional information, please reference the document titled “Verifying Participant Eligibility”, located on the Provider Participation page at http://dss.mo.gov/mhd/providers/, under the General Information section. If you have questions regarding this change, please contact the Provider Communications Unit at (573) 751-2896. Refer to section 1.2.B of any provider manual to see information regarding verifying eligibility. It is important to remember when it is appropriate to bill MO HealthNet an outpatient hospital facility charge. Inappropriate billing of facility charges will result in recoupment of payments. The following information can be found in the MO HealthNet hospital provider manual which is available at http://manuals.momed.com/manuals/. Please refer to sections 13.38, 15.20, 15.21 and 15.23 for more information regarding outpatient facility charges. IV infusion services, including but not limited to: chemotherapy, antibiotic therapy, hydration therapy, immune globulin therapy, IV rate change and pitocin. Infusion therapy by nurses in an outpatient setting may be added to the outpatient facility charge. Services such as: venipuncture, specimen collection, taking and monitoring vitals, prepping, positioning, injecting, call-back services, stat charges, routine monitoring (e.g. fetal, cardiac, etc. ), after-hours services; claim filing fees; education/instruction (e.g. colostomy care, cardiac care, etc. ), handling charge for specimens referred to an independent laboratory, late discharge fee, preparation of special reports sent to insurance companies, psychiatric reports for court evaluation or juvenile court and standby equipment. The following operational cost elements: administrative costs, basic floor stock supplies, durable, reusable items or medical equipment, fixed building costs, furnishings, insurance, laundry, maintenance, nursing salaries, paramedical salaries, records maintenance and utilities. Services provided by a physician assistant (PA), including those provided in an outpatient hospital-owned clinic. If the following services are the only services provided during a visit, without any physician services, a facility charge must not be shown: physical, occupational or speech therapy; renal dialysis; injections/immunizations; laboratory/pathology; radiology; HCY/EPSDT services. These services can be billed by the hospital using the appropriate HCPCS Level I (CPT), Level II or Level III procedure code. The costs of diagnostic testing and treatment type equipment should be included in the charge for the specific service provided to the patient. The costs of hospital staff who are necessary to the performance of the specific service should be included in the charge for that service. A facility charge code may not be billed by the hospital on the same date of service as cardiac rehabilitation unless a physician provided services on that day. Only one facility code may be shown per date of service. If several physicians or clinics are seen, the charges must be combined into one facility code. A charge for an observation service is not considered a facility charge. Therefore, as an example, a provider can show a surgery facility code and an observation code for the same date of service. The MO HealthNet Division (MHD) Provider Education staff will be conducting additional webinar trainings regarding the expansion of state-wide Managed Care, effective May 1, 2017. Currently, there are four webinars scheduled for February 22 and 28, 2017, and March 9 and 30, 2017, from 9:00 AM to 11:00 AM. All MO HealthNet Provider Training schedules can be found on the Provider Page under the Education heading. Then click on Training Information. Scheduled trainings and enrollment information is posted on this page. Please contact Provider Education staff at MHD.PROVTRAIN@dss.mo.gov (preferred method) or (573) 751-6963 with any questions or training needs. Hot Tips will be published notifying providers of future trainings. Providers should continue to view this page for updates. The MO HealthNet Webinar Training Conference schedule for the 1st Quarter has been updated. We will not offer training for the following programs during the 1st quarter: Local Public Health Agency, Outpatient Hospital, Medical Clinics and Physicians, Inpatient Hospital, Rural Health Clinic Independent, and Rural Health Clinic Provider-Based. The above programs will be included in the 2nd quarter webinar schedule that will be posted in early March 2017. Please access the 1st Quarter 2017 Webinar Trainings to register. The MO HealthNet Division (MHD) Provider Education staff conducts yearly general program workshops. Instructions on how to register are outlined on the workshop schedule. If a provider has registered for a workshop and cannot attend for any reason, contact MHD Provider Education Unit to cancel the registration. The Provider Education staff may be contacted by phone at (573)-751-6963, or by email at MHD.provtrain@dss.mo.gov. Would require a letter of medical necessity from the patient’s primary care provider The medical necessity must meet MO HealthNet policy in Section 13 of the Dental Manual. Code could be used with appropriate documentation of the problem. D0150 - Comprehensive Oral Evaluation - new or established patient. This is generally billed once per patient per provider. Per the ADA CDT Coding book: “Applies to new patients; established patients that have had a significant change in health conditions or other unusual circumstances by report or established patients that have been absent from active treatment for 3 or more years”. This examination includes periodontal charting. Note: May use Propofol, but only at the Moderate level of sedation. Patients are still able to access other Medically Necessary Dental Services as outlined in Section 13 of the Dental Manual. Note: You must have adequate documentation of the patient’s Medical Necessity and have a physician’s referral in the participant’s file. Preoperative assessment time and post-operative recovery time are not covered under this code. These codes have a limit of 3 per date of service. Additional units will require justifying documentation to be submitted. Only bill for services you have documented proof of providing. Some procedure codes require certain services to be performed. Document what services were provided. Be sure they match the code being billed. Ensure that reimbursement can be readily justified by documentation of key information, such as symptoms, conditions, diagnoses, treatments, and prognosis. Identify the patient who was treated.